Pick ANY Color, ALL IN STOCK! 2 DAY SHIPPING! Safety Sealed. 1 15ml bottle. Castor oil has the amazing ability to prevent cataracts and is said to be able cure cataracts in 2 to 6 months with daily use. 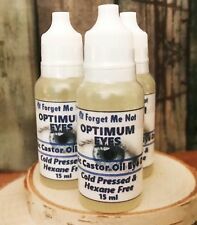 Castor Oil effectively treats Blepharitis, and in many cases with continued use, people stay symptom free. The gel produces a fine transparent film on your eye. This protects, soothes and lubricates the surface of your eye. Used by people who do not produce enough of their own tears or because the tear film in the eye is unstable. Antioxidants: N-Acetyl-Carnosine (NAC) 1%. Buffers: Borate. This gentle formula starts working on redness caused by minor irritation in 60 seconds and provides lasting relief for up to eight hours. Gentle formula prevents redness for up to 8hrs. It provides lubrication to the eye surface for at least 6 hours. Do not allow the tip of the tube to touch the eye. MAXIMUM ORDER QTY - 10 PCS. MAXIMUM ORDER QTY - 5 PCS. Eumill Protection. Gocce oculari ad effetto lubrificante ed idratante, in pratiche confezioni monodose sterili a base di acqua distillata di Malva e Acido Ialuronico. 3 ConfezionI da 10 pezzi per 0,5 ml. EXP 12/2020! The LARGE Size (0.25 oz) is 3Xs the amount of the regular (0.08 oz) size. Making this Lot equivalent to 6 Regular Size Boxes! - Works in 1 minute. Purchasing Health/Eye/Dietary OTC products Online on the Secondary Market is cautious enough, and there should be no guesswork in what will actually arrive to you. Geekzany is here for you! About Geekzany. The bottle adds convenience particularly for patients with handling difficulties. Key lubricant: 0.2% Sodium Hyaluronate. Do not allow the tip of the dropper to touch the eye. Eye baths are designed to make the application of eye wash more comfortable. You simply pour suitable eye wash fluid into the cup then move you eye over the cup titling your head back allowing the fluid to rinse around your eye. Vast majority of the products will arrive anywhere between 4 to 7 weeks if not sooner. resolve it right away. make you happy. LASIK patients may report Dry Eye after surgery, even if they did not experience Dry Eye symptoms previously. 100 Single Vials. Others remove redness from your eyes. Over-the-counter artificial tears are designed to provide temporary relief to the symptoms associated with Dry Eye. 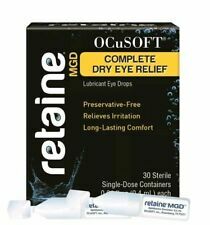 Sodium hyaluronate 0.18%, with proven efficacy in relieving sensations of ocular dryness. Compare to Refresh PM! BEST DATES AVAILABLE ON THE MARKET! There is not a later date currently available on the market! These are by far the Latest and Freshest Dates from the Manufacturer! EXPIRATION DATES IS 01/2022 ON ALL 5 BOXES! Lubristil Gel gives relief to the symptoms of ocular dryness of different origin. The Answer - Lubristil Gel. The Key features of Lubristil Gel are The eyes may feel scratchy or gritty and uncomfortable. Blink Cleansing Eye Wash provides relief from dry-feeling, tired eyes. Contains sodium hyaluronate with aloe vera and euphrasia. blink Cleansing Eye Wash.
CRIAL gocce oculari 10ml. Soluzione isotonica tamponata a pH7,2. HA: Sodio ialuronato. - ambienti fumosi o con aria condizionata;. - alterazioni non traumatiche non patologiche degli occhi;. Lubristil from Moorfields Hospital. This makes it suitable to treat any levels of dry eye. Do not allow the tip of the dropper to touch the eye. 40 x 0.3ml individual vials. Emustil is made from 7% Soybean oil and 3% Natural Phospholipids. 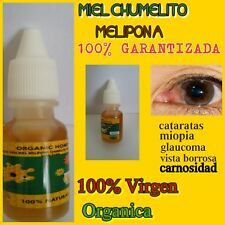 Emustil Eye Drop Emulsion 20 x 0.3ml vials. Dry Eyes is a common cause of eye irritation, Dry Eyes occur when there are not enough tears to keep the eye lubricated. REDNESS RELIEF FORMULA. EACH BOTTLE INCLUDES 1/2 FL OZ- 2 & 1/2 FL OZ TOTAL. MAXIMUM STRENGTH. EACH BOTTLE HAS BEEN INSPECTED AS NEW / SEALED. NEW / BOXES MAY BE MISSING. EXPIRATION DATES: (1) 08/2019, (3) 10/2019 & (1) 03/2020. Blink Intensive Tears PLUS - The latest addition to the blink eye drop range will help sufferers of more persistent dry feeling eyes smile again. Size: 3 x 10ml bottle. Less lash crusting was reported compared to a competitor gel with blink Intensive Tears Plus liquid gel. For irrigation, rewetting and lubrication and for the removal of foreign objects from the eye. Solution contains 0,075% hyaluronic acid in a 20ml bottle. It can be used to mildly wash and gently remove everything that should not be in the eye or on the surface of the lens for irrigation, rewetting and lubrication.